Most of our interactions at work focus on content, reasonably and calmly. We work together to get things done, most of the time. Even when we hit speed bumps, rumble strips or road humps, we continue to work together — mostly. At other times, we get frazzled, frustrated, angry, manic, incensed, outraged, or even murderous. How can we get control sooner and keep control more often? A still frame from the animation, "Accretion Spins Pulsar to Millisecond Range." Many natural processes act so as to limit themselves. 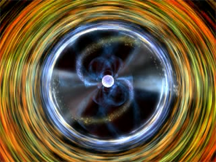 The figure above is a frame from an animation of a pulsar accreting material from a star near it. The accretion causes the pulsar's rotation to increase, which increases its gravitational radiation, which in turn, decreases the pulsar spin rate. In effect, the gravitational radiation, which results from increasing spin, limits the spin rate. In a nascent conflict, the stance of Bemused Detachment (or any alternative self-discipline) is triggered by actual or perceived offense, and it, in turn, reduces the likelihood of responding with another offense. Image courtesy U.S. National Aeronautics and Space Administration. A practice of self-discipline of some form does help. Some people focus on their breathing. For me, it's a stance I call bemused detachment. It doesn't work every time, but it often helps. When we work together, bumps, affronts, and insults sometimes happen. And sometimes, they don't happen but we think they did. Either way, we react faster than we know. We judge others and their intentions, and sometimes we feel the urge to extract revenge, or to teach them lessons they haven't asked for. When we act on these urges, we can create for ourselves new memories to regret. Goodness knows, we don't need any more of those. I already have plenty to regret. We react not only to what others have said or done, but also to our own interpretations and to the significance we attach to those interpretations. If we can manage to slow down, we're less likely to act on the urge for revenge or the urge to educate. Bemused detachment gives me a way to ask questions, silently, of myself, which slows me down. I like humor, so I try to ask whacky, somewhat funny questions. For example, when someone is rude to me, I can ask myself, "I wonder who spread the asphalt on his toast this morning?" Or, "Did I remember to remove the bull's-eye from my chest before I walked in here?" Or, "If this guy is trying to get me to lose it, I wonder if that really is the best he can do." After some regrettably reactive incidents, practice coming up with interpretations of whatever you reacted to. Find as many interpretations as you can that have nothing to do with you. Observe others reacting, and find interpretations of what they reacted to that were not about them. Since these incidents probably aren't about you, you might be able to discover not-about-them interpretations more easily. Would you like to see your comments posted here? rbrenFMNmPNCKeWkvskCKner@ChacFhmavMZZaHZIApehoCanyon.comSend me your comments by email, or by Web form. I offer email and telephone coaching at both corporate and individual rates. Contact Rick for details at rbrenpZndDOQYOLWRyTLYner@ChacOrnCDtSwHNUAkIGcoCanyon.com or (650) 787-6475, or toll-free in the continental US at (866) 378-5470.